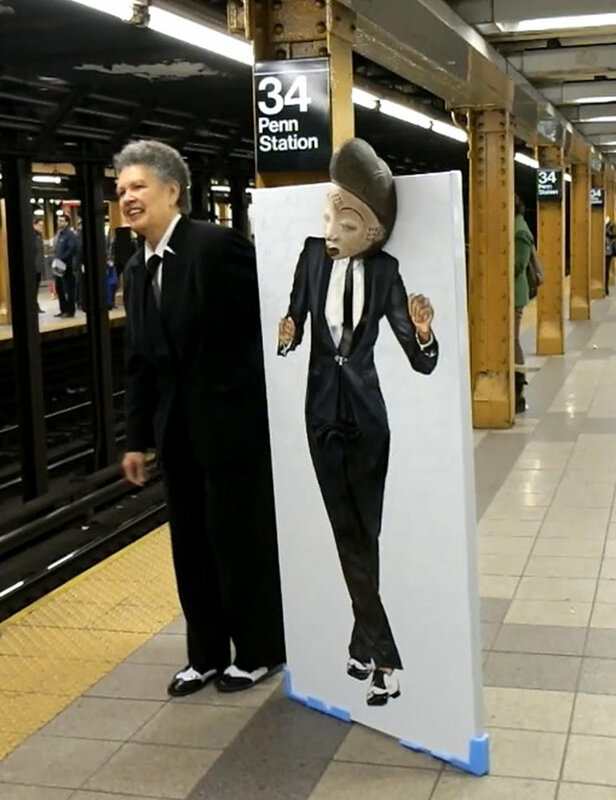 Standing Ovation is part of Margaret’s larger ongoing series, The African Diva Project, created to reconnect Black art, music, and performance to its African roots. Standing Ovation is comprised of select figures taken from The African Diva Project, printed to life-size, and installed on the Jamaica Performing Arts Center lawn. Margaret chose JPAC for its cultural significance in Jamaica and its role as a central space for the community to enjoy performances. The installation will be on view through March 2019. As part of Margaret’s vision for Standing Ovation, she will be auctioning off each figure to raise funds for JPAC, to contribute to future opportunities for the public. Be on the look-out for the March Standing Ovation Figure Auction invitation - It’ll be a celebration of Art, Women and Queens commitment to Culture! Jamaica Center for Arts and Learning is proud to be the host site for Ms. Vendryes’ hallmark public art work. This presentation offers the Southeast Queens residents along with JCAL’s audiences and School of the Arts students the opportunity to experience visual artist Margaret Rose Vendryes’ work in a new way; outside the gallery in an open space. JCAL’s partnership with Queens Council on the Arts, ensuring the Standing Ovation project was realized, highlights the value of shared resources to support the success of the arts and of Queens’ greatest assets, its artists.“ Cathy Hung, JCAL’s executive director. “JCAL’s team is incredibly excited to work with Margaret Rose Vendryes. We are grateful she created a public work specific to JPAC and feels JCAL is a seminal symbol of culture. She is a Queens cultural icon who created public work with a deep connection to her ongoing visual ouevre of black female empowerment, tapping into the feminine elements and ritual roots of African culture. Margaret is a blazing representative of all women and especially those of the African diaspora.” Catherine A. Peila, JCAL’s Director of Programming and Artist Services. Read more about Margaret Rose Vendryes on our blog! Host Organization: Jamaica Center for Arts and Learning (JCAL) founded in 1972, is a multidisciplinary arts center based in the diverse community of Southeast Queens. Its mission is to offer quality visual, performing, digital and literary arts, and to provide accessible education and community programs and access to subsidized community space - encouraging participation in the arts. JCAL's cultural campus includes two buildings, the Jamaica Arts Center (JAC) 161-04 Jamaica Avenue and the Jamaica Performing Arts Center (JPAC), located 1 block away 153-10 Jamaica from JAC helping build a Jamaica Avenue Cultural Corridor.JCAL, an incubator for creativity, is a 45-year-old multidisciplinary urban arts center built by the Southeast Queens community. JCAL programs represent and serve the diverse communities of Queens (over 185 languages spoken) and NYC. More than 52,000 people of all ages and backgrounds come through our doors engaging in our children, teens, and adult programs including multicultural series in music, theater, and dance performances; film screenings and lectures; contemporary visual arts exhibitions; in-school artist residencies; a series of nearly 50 different art workshops; and free or low-cost after-school and summer programs. JCAL's programs are made possible by Mertz Gilmore Foundation, the Jerome Foundation, the NYC Department of Cultural Affairs, New York State Council on the Arts, Greater Jamaica Development Corporation, Resort World Casino, American Airlines and individual contributions.JCAL receives ongoing general operating support from the New York City Department of Cultural Affairs with support from Mayor Bill de Blasio, Queens Borough President Melinda Katz, the Queens Delegation of the New York City Council, New York City Councilman I. Daneek Miller, Councilman Barry Grodenchik, Councilman Rory Lancman, and Councilwoman Adrienne Adams, New York State Regional Economic Development Council.